Three weeks ago, an alien species called the Vitat, invaded the earth. They broke through the earth’s atmosphere and decimated the human population in moments. Their goal? Nothing but destruction and to feed their endless appetites. Their hive queen orbits earth in their warship, waiting until her hive have taken over the planet and she can consume earth’s sun to grow her massive hive. But the humans are not alone in their fight to regain control of their planet. Another alien species, the Dahk, have come to their aid by order of their king. But what Fihk, the Dahk acting commander, is unaware of, is that his king had his own agenda regarding the humans survival. As does the Galactic Council. 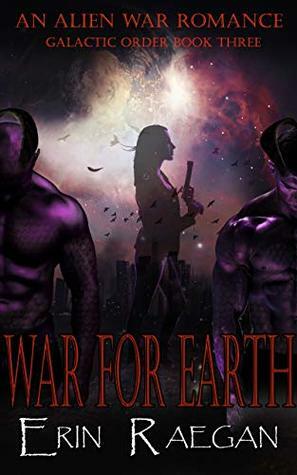 The humans are not only in danger of the carnivorous Vitat, but also a council of several alien species dedicated in their endeavor to enslave them. Fihk’s own council and the Juldo Master at the helm. As the humans try to fight back and survive one invasion, another is already underway. Every minute of everyday is now a struggle to survive. Just one minute to the next. My brother is my only concern. His safety is everything to me. But aliens are making that an impossible task. Not one species, but two. The white aliens just want to gnaw on us, but the new aliens, the Dahk, want something different. Specifically, two of them. Olynth can’t stand me but can’t let me go either, and Fihk, he’s made it clear Nate and I are to help him no matter that all I want to do is escape them. I can’t trust them. They want things from me I can’t give them. Survival is the only thing that matters, even if I have to go through an entire universe of species’ to get it. Even my own. Erin Raegan is an obsessed reader, a dedicated writer, and a lover of all things fantastically impossible. When shes not plotting her next project, she spends hours on her kindle, though nothing beats a real book in your hands. She can be found at home in Connecticut with her chihuahua Minnie, and her German Shepard Odin, waiting with her 6 year old son for her active duty husband to come home.